Plant now for flowers this year, and for many years after. Cut back all old growth after flowering each Autumn. Supplied as a pack of 5 mixed bare root plants for planting out Jan - May. Hardy Geraniums, or 'Cranesbills' as they are commonly known, are one of the easiest and best garden performers for low maintenance, flowering displays and versatility to growing conditions. Everyone should find space for them! Not to be confused with bedding Geraniums, more correctly called Pelargoniums, these really are one of the most versatile plants - sun or shade, wet or dry, pots or garden, they just keep doing their thing year after year. From their dormant state over-winter, in spring they produce neat and tidy small domes of leaves, which are smothered in flowers in Summer. A mecca for bees, they will be buzzing with activity on sunny days. In Autumn, the leaves often turn red orange too. A simple trim off of old growth in Autumn is all they need - what could be easier. 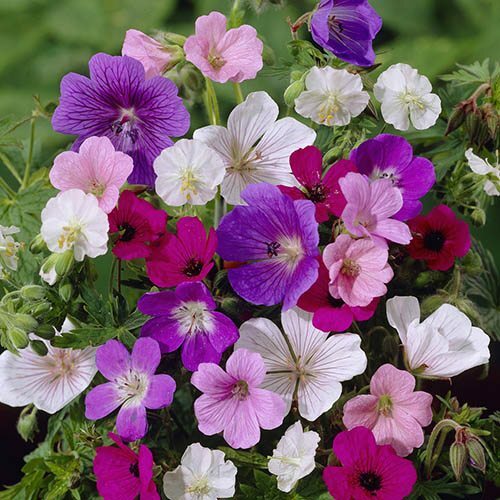 Supplied as a mixed pack of bare root plants, in a mix of white, pale pink, purple, blue and rose. Plant straight in garden, for flowers in first Summer.